Roy Williams said that his team can't handle adversity. Well, the North Carolina players proved their head coach right with their 73-68 loss to Duke on Wednesday night. Down four points at the half, Duke outscored UNC 44-35 in the second half to pull off the comeback win. Late in the second half, the Tar Heels missed 6 straight free throws to finish the game a miserable 13-of-23 from the charity stripe. 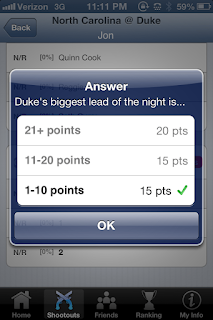 Conversely, Duke drained 17 of their 20 free throws. UNC has proved throughout this season that they have a habit of coming up small in big moments. Roy Williams' squad has beaten just one ranked opponent this year, #20 UNLV, and lost to four others. In two of those losses -- blowouts against Miami and Indiana -- the Tar Heels shot under 40%. While Duke has had its share of troubles this year, it wouldn't have surprised any analyst if the Blue Devils blew North Carolina out, particularly since the game took place in the hostile confines of Cameron Indoor. 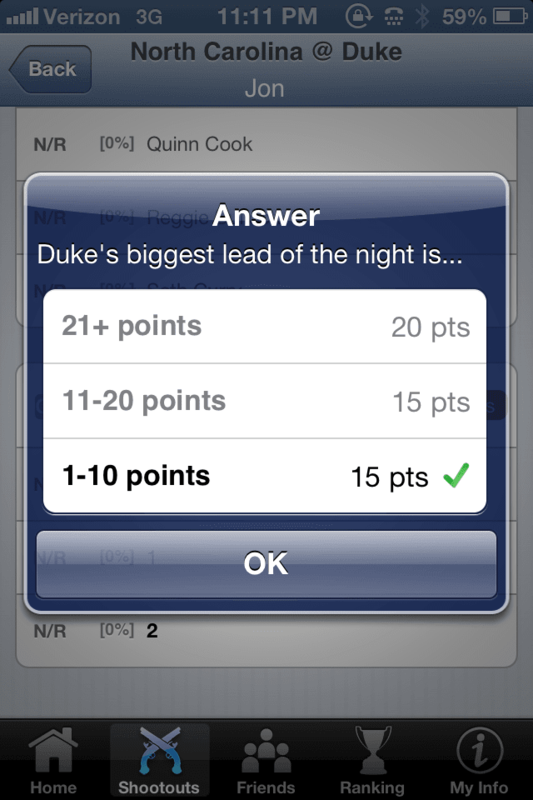 That's why we presented our audience with this SnapCall asking what Duke's biggest lead of the night would be. When you consider that UNC wound up shooting just 37.9% from the field, it's surprising they actually held a lead at any point. Then again, the team does have a talented core of players. James Michael McAdoo is one of the toughest low-post players in the country and Reggie Bullock is an efficient scorer. Ultimately, the problem is that Roy Williams can't seem to get the most out of his players in crunch time. The Tar Heels held a lead for the first 26 minutes of the game, but then things went downhill. Duke grabbed its first lead with 14:10 to play and by the 13:28 mark they put their foot on the gas and never relinquished control. To compete against the entire viewing audience during big games, download SnapCall Sports (free) from the App Store.